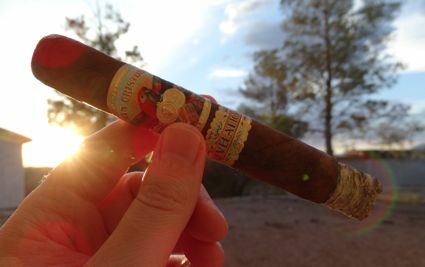 For as long as I can remember, Ashton’s Virgin Sun Grown (VSG) line has been revered and sought after by cigar smokers. It is not always easy to find, and it commands a price dictated by its quality and high demand. The Ecuadorian Sumatra leaf that covers the VSG is the benchmark for Sun Grown taste, in my humble (or not-so-humble) opinion. The bright zing of this tobacco, grown by the Oliva family for Ashton, is what makes the VSG sing. 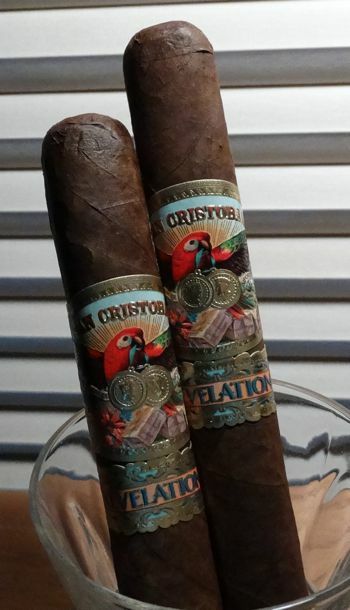 Now there is another voice to join that virgin choir — San Cristobal Revelation — which is made with a wrapper leaf from the same plant as the one used on the VSG. There is a slight difference, however. The VSG uses a stronger, spicier leaf from the top of the plant, whereas San Cristobal Revelation uses a milder mid-level viso leaf. But the similarities between the VSG and the SC Revelation end there. The VSG is more of a Fuente blend featuring Dominican tobacco, while San Cristobal bears the mark of Pepin Garcia: the binder and filler leaves are Nicaraguan and the cigar is made by My Father Cigars in Esteli. The Revelation Legend is a box pressed toro with a mottled chocolate brown wrapper and a well formed head. The cap is not as perfect as I’ve seen on other cigars out of this factory in recent years, but it’s attractive and certainly functional. The roll is solid and the draw is excellent. The cigar burns evenly, especially for a pressed stick, although it seems to burn more quickly than I had expected. There are no overheating issues and the cigar is rolled well, so this isn’t a significant issue. The first inch of the Revelation Legend is peppery with the tannic dryness typical of most Nicaraguan blends these days. Pepin’s peppery hallmark has been appropriated (or perhaps the polite word is emulated) by so many other cigar makers that pepper-and-tannin has become the standard for Nicaraguan cigars. But the pepper here is not overwhelming, and in keeping with the medium-bodied tenor of the cigar it fades to allow cedar and a slightly spicy floral note come to the fore. Sun grown flavors make their appearance in the mid-section of the cigar — a cinammon zing with chocolate and cedar in the background. Along with the spice there is a touch of sweetness enhanced by the cedary aroma. The smoke concludes with a spicy char and a lengthy finish. This is a medium-bodied cigar, but it ends on a powerful, if somewhat muddied and less complex note. Revelation is a fine addition to the San Cristobal line. It’s not as heavy as the original San Cristobal, but it’s spicier than the San Cristobal Elegancia. The tannins in the first inch might lighten up a bit over time, but these blends are made that way intentionally and aren’t intended to fade, so pucker up and enjoy. So how does the Revelation stand up to the VSG? It makes a decent showing, but it is a far milder cigar. It’s like comparing Beethoven to Schumann. Perhaps it’s not a fair comparison, but most cigar smokers will choose the pounding chords of the VSG over the gentle but soulful Revelation. That is no reflection on the quality of the Revelation; it’s just a matter of how much water you like in your whiskey. Sometimes a little splash is nice. The Legend runs right around $8 USD. Man, I love the imagery of that final paragraph. Well done! It’s been a while since I smoked this one, and my memories of it have faded, but I do have another waiting. I had contemplated smoking about a week ago, and now I’m inspired to light it up soon!